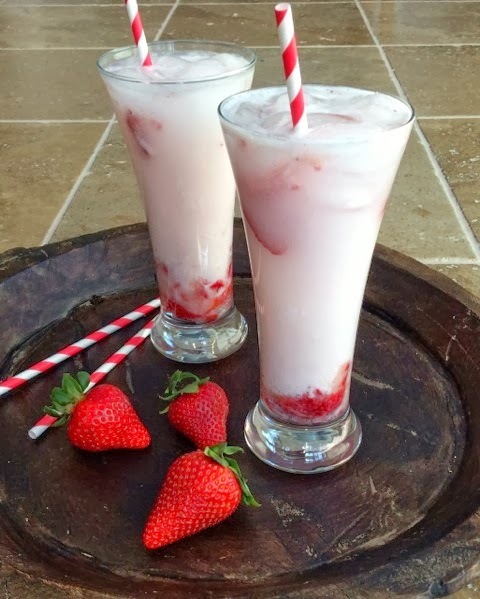 This recipe for my Strawberry Coconut Cream Sparkling Beverage is not only quick and easy to prepare, but also incredibly delicious, and low in calories. This creamy beverage is perfect for Valentine's Day or any other day. A real treat and of course it is gluten and dairy free! One sip of this and you will never feel deprived again. 3 cups of frozen or fresh strawberries Note: If you use frozen defrost and drain thoroughly. In a medium bowl combine strawberries and sugar; stir well to combine. Use a fork or potato masher to coarsely mash the strawberries. Place 1/3 cup of the mashed strawberries in each of six glasses. To each glass add ice, 2 tablespoons coconut milk, and 1/2 to 2/3 cup club soda or sparkling water. Stir drinks just before serving. Garnish with fresh strawberries. Thanks again for visiting my blog and don't forget to sign up in the subscription box on the upper right hand side to receive all my upcoming recipes, product recommendations and tips. Have a great day! Yum! Healthy soda?! I'm in!